Objective – Previous studies using simulation technology have largely focused on technical skills. The objective of this study was to assess the usefulness of a newly developed laparoscopic ventral hernia (LVH) simulator to assess intra-operative decision making. 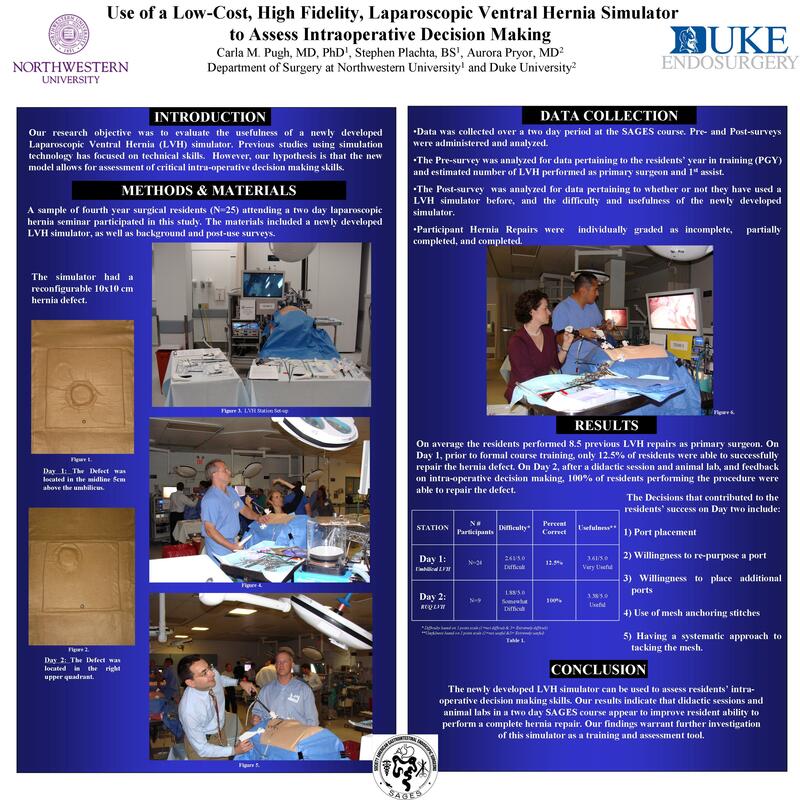 Methods – Participants included fourth year surgical residents attending a two day laparoscopic hernia course. The materials included a newly developed LVH simulator, background and post-use surveys. The simulator had a reconfigurable 10 x 10 cm hernia defect. On day one, the defect was located in the midline 5cm above the umbilicus. On day two, the defect was located in the right upper quadrant. Results – Background surveys revealed residents (N=24) had performed, on average, 8.5 previous LVH repairs as primary surgeon. On a 5-point scale (1=not difficult & 5 = extremely difficult) the residents rated the day one simulator as “difficult” (2.61/5.0) and the usefulness as “very useful” (3.61/5). On day 1, prior to formal, course training, only 12.5% of residents were able to successfully repair the hernia defect. On day two after a didactic session and animal lab, 100% of the residents were able to repair the defect. The day two simulator was rated as “somewhat difficult” (1.88/5) and “useful” (3.38/5). The decisions residents made that contributed to their success on day two include: 1) Port placement, 2) willingness to re-purpose a port, 3) willingness to place additional ports, 4) use of mesh anchoring stitches, and 4) having a systematic approach to tacking the mesh. Conclusions – The newly developed LVH simulator can be used to assess residents’ decision making skills. Our results indicate that didactic sessions and animal labs in a two day SAGES course appear to improve resident decision making. Our findings warrant further investigation of this simulator as a training and assessment tool.